Extensive range of top quality luxury duvet covers from Connie Home Collection. Available in linen, Egyptian cotton and standard cotton in various designs. Select your desired size of duvet cover and follow the bed size chart to choose the appropriate duvet cover for your bed size. Light and comfortable elegant duvet covers suitable for using all year round. Made from 100% natural cotton with a high 300 thread count and edging or decoration in many of the collections, such as the Harmony duvet cover. 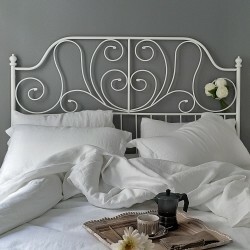 The decorative edging brings a casual and stylish look to your bed linen. The soft feel is enhanced by the addition of satin fibres during the production process. The result is not only visually attractive as in the Victoria luxury duvet cover, but the softness is appreciable against your skin. With our 100% cotton 300 thread count luxurious duvet covers you can enjoy a relaxing and rejuvenating sleep. This is partly due to the 100% natural textiles with fibres free of any damaging chemicals or synthetic materials. Our cotton duvet covers are available in a range of bed sizes to accommodate single, double, king size and super king size mattresses. 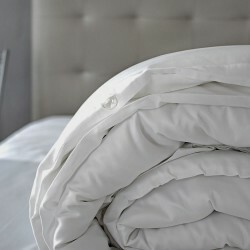 A perfect night’s sleep is within reach with the elegant and natural Connie Home duvet covers. The 500 thread count 100% Egyptian cotton elegant duvet cover is aimed at clients looking for the highest quality of bed linen. For that reason Connie Home has included in their ranges of quality cotton duvet covers the Provence Collection. This collection has been created from top quality natural cotton and made by the artisans of Portugal into the soft and strong 500 thread count luxury duvet cover. The higher thread count allows the finished fabric to be both soft to the touch and very strong. The durable nature of this duvet cover is particularly evident over time, even after many washes the Provence duvet cover retains it’s soft feel. With the simple, pure white design and without any elaborate borders, the 500 thread count high-end duvet cover has a simple yet elegant finish. Duvet covers made from 100% natural stonewashed linen, using carefully selected vegetal fibres with the objective of creating an attractive rustic look. This simple, lightly ruffled appearance is achieved with the Connie Home Atlanta linen duvet cover. Your bed will appear inviting and comfortable all year round because the quality linen duvet cover adapts to the warmth or coolness of each season. In addition to the anti-allergic properties of natural linen which are perfect for all types of skin. The luxury duvet cover made from linen absorbs humidity and helps you to enjoy a rejuvenating and relaxing sleep. The Atlanta Collection 100% linen duvet cover is perfectly pitched to achieve the equilibrium of price and quality. The softness of the linen and it’s durability over time mean it is not the cheapest, but is the ideal solution for discerning customers. Available in a simple pure white colour and in all sizes, single, double, king and super king.